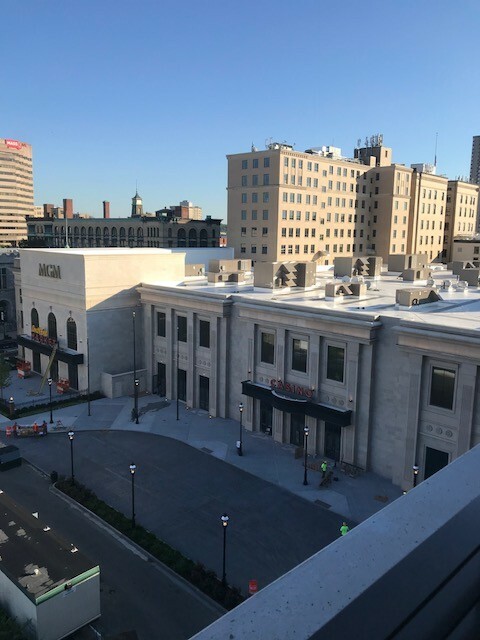 Duct & Vent Cleaning of America, Inc. (DVCA) recently completed a project to clean specific areas of the HVAC system for the new $950,000,000 casino in Springfield, Massachusetts. We were hired by the sheet metal contractor at the direction of the property owner to work on a time and material basis. This time sensitive project included cleaning the air handling units (AHUs) and ductwork, which allowed the building to undergo the final stages of building commissioning. That also included the air balancers being able to do their job and the air systems to be commissioned and begin running to full capacity throughout the property. This final step in the construction process kept the casino on track to open on the scheduled date. The details of our work at the direction of the customer included contact HEPA (high efficiency particulate air) vacuuming 17 return air risers serving the second level of the podium section of the casino. HEPA vacuums and filters can trap 99.97% of particles 0.3 microns or greater. Risers were cleaned 20 feet upwards or to a turn. Fire dampers in all 17 risers were contact HEPA vacuumed and hand wiped. In addition, return ductwork for AHUs 6 and 10, where reachable and accessible, were contact HEPA vacuumed inwards of 20 feet or to a turn. We also contact HEPA vacuumed and hand wiped 44 rooftop AHUs, including supply and return sides. All AHUs were shut off and power was locked out prior to cleaning. All AHUs service panels were removed to gain access into various unit compartments. Air filters were removed prior to cleaning activities and new filters were installed when cleaning was complete. All surfaces were hand contact HEPA vacuumed using portable backpacks and stand up 12 gallon and large negative air 5000 CFM HEPA vacuum units. All coils were surfaced vacuumed and spray washed with a non-alkali coil cleaning solution. These units were hand wiped as well because metal shavings were present and posed a threat to the roof membrane that were cleaned. All work was performed in adherence to the National Air Duct Cleaners Associations (NADCA) standards ACR 2013.